!!! This update brings search and shortcuts to the Free version as well as ability to hide this annoing ads for 30 minutes by tapping on it! !!! - Easy browsing the media library. - Easy searching the media library. - Easy and user friendly access to songs, albums, genres, etc. - Creating shortcuts on the Start screen. - Full support of the current Windows Theme. - To search: when in any category (album, genre, artist, songs), scroll to the top of the list and after that scroll more up. A search textbox will appear! To hide a search textbox, simply scroll up one time. To cancel search results scroll up one more time! - To add a group (category, album, genre, artist) to a Start Screen, simply tap on the title. The button with a shortcut icon will appear. Clicking the button will add a nice shortcut on your Start Screen. 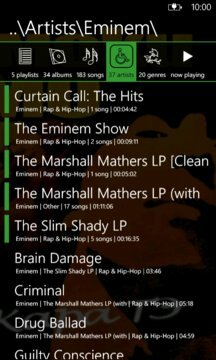 - To find current playing song in the list, simply tap its title when on Now Playing tab. The list will scroll and find that song for you! P.S. We got some downloads already!! I appreciate any feedback about bugs and ways to improve the app. More awesome features are on the way! Thank you for using the app and again, enjoy!